WASHINGTON — Concerned about the rising prevalence and sophistication of identity theft, most private health insurance companies have abandoned the use of Social Security numbers to identify individuals. The federal government even forbids private insurers to use the numbers on insurance cards when they provide medical or drug benefits under contract with Medicare. APRIL 7, 2015: At the proverbial 11th hour, U-Mass Medical Group agreed to a new contract with the state’s Group Insurance Commission and its basic indemnity plan carrier, UniCare. For months U-Mass Medical had baulked at agreeing to a new UniCare contract, despite repeated attempts by the GIC and UniCare officials to broker a deal. The dispute was reportedly due to a disagreement over reimbursement rates paid to U-Mass. Officials claimed that the rates offered by the GIC through UniCare were too low. FEBRUARY 17, 2015: Over the objections of our Association and union representatives, the Commonwealth’s Group Insurance Commission (GIC) voted to increase copayments and deductibles for Fiscal Year 2016, beginning July 1, 2015. While this increase marks the first of its kind in more than five years, Association officials strongly oppose what we view as further cost shifting onto the backs of retirees and employees who utilize their insurance benefits. 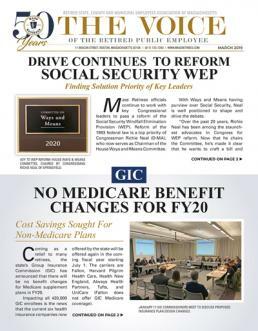 DECEMBER 19, 2014: As reported in the January 2014 edition of the Voice, the state’s Group Insurance Commission (GIC) is grappling with a significant budget deficit for the current fiscal year. However, it now appears that the problem is more significant than previously thought. At today’s GIC meeting, Executive Director Dolores Mitchell characterized the deficit as being “north of $120 million” – some $70 million higher than previously thought.